How Often Should You Cycle Off of Pre-Workout Supplements? Pre-workout supplements are very popular among bodybuilders, athletes and general gym-goers. Many supplements can help to prepare you psychologically for exercise by boosting your mental clarity and focus. According to Chris Shugart, fitness writer for bodybuilding website T Nation, pre-workout supplements can also help you to feel energized and prepare your muscles for a tough workout. While there are many pre-workout products on the market, three of the most commonly used are creatine, caffeine and beta alanine. If you use any of these, it's important to know how you should cycle them. Creatine is an essential amino acid found in many protein-rich foods, and can be taken in higher supplemental doses to help boost performance. Creatine aids in the production of ATP, your body's main energy source for short, intense activities, and also helps to buffer lactic acid. To begin with, take creatine before your workouts for two months, then take a month off it. 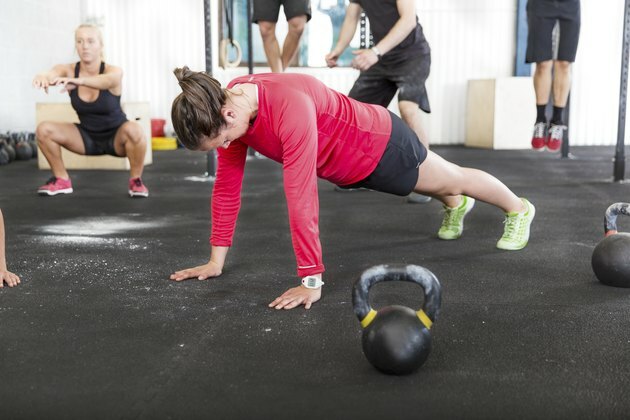 At the end of this month, you will notice a slight drop in strength and energy levels, which is perfectly normal, but is also a good signal to start taking it again, according to Charles Poliquin, renowned strength coach and owner of the Poliquin Performance Center for elite athletes. Many people use caffeine as an ergogenic aid -- or a performance enhancing substance -- before a workout or sporting event in the form of coffee, but Poliquin recommends that caffeine capsules are a better choice, as they provide you with energy sooner, and allow you to take larger, more effective doses. While it is safe to consume caffeine year-round, you should curtail your intake if you consume more than 500 to 600 mg per day, or start to feel jittery after taking caffeine. Over time, you also develop a small immunity to caffeine, meaning it gives you less of an energy boost. In order to make sure you get the most from caffeine pre-workout, take one week off it once every couple of months. Beta alanine is an amino acid and is known for its ability to improve workout performance, by delaying the accumulation of hydrogen ions in your muscles, helping to decrease soreness. Like creatine, the effects of beta alanine can decrease if you take it all the time, so it is a good idea to have short periods off from taking it. Stick to the same cycle as creatine -- two months on, one month off. Before starting any pre-workout supplement protocol, you should check with your doctor that none of the supplements will cause you any adverse effects. If you are a competing athlete, it is also a good idea to check that none of the substances you take are banned by your federation. You must also remember that while pre-workout aids can be very useful, there is no substitute for a healthy, balanced diet to help you get the most from your training. If at any time you feel unwell when taking supplements, cease consumption immediately, and speak with a medical professional.